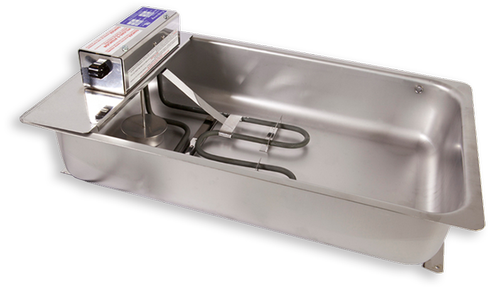 Backer Springfield's anti-condensate pans are used by leading companies in Commercial Refrigeration, HVAC, and Vertical Transportation (elevators). These durable and reliable products use the highest quality components, including NSF certified pans, to evaporate defrost and condensation where no drain line is available. Our products have successfully passed rigorous testing and are UL recognized in the USA and Canada. 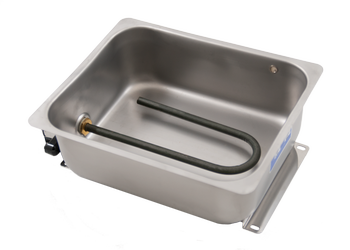 The original electric condensate evaporator pan takes advantage of a traditional style element design that can reliably supply high wattage suitable for non-low flash point refrigerants. 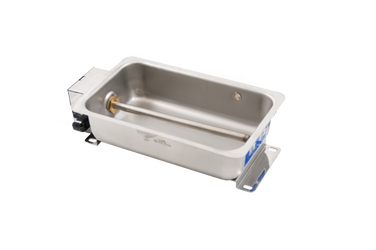 When activated by the float switch, the heating element with a wattage range from 200 watts to 3000 watts will provide the required heat into the application to eliminate condensation water. The positive thermal coefficient (PTC) electric condensate evaporator pan takes advantage of new technology that can reliably supply wattage at a lower level suitable for low flash point refrigerants. Wattage is constantly being provided at a reduced rate of approximately 10% of nominal value in open air as the resistance is self-regulated to a higher value with the higher sheath temperature. Once condensate water is introduced to the heating element wattage will be provided at the nominal value as the resistance is self-regulated to a lower value with the lower sheath temperature. There are four wattage levels available with the PTC designs which are 400 watts, 500 watts, 750 watts, and 1000 watts with the u-bend shape. Our advanced engineering and design capabilities offer total customization to fit your application. Contact your local Backer Springfield sales representative or call 1-800-692-4733 for additional configurations and specifications.